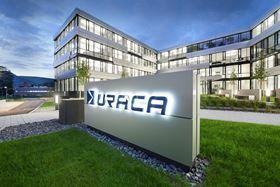 Uraca’s facility in Bad Urach, Germany. German pump manufacturer Uraca GmbH & Co KG has bought Nürtingen-based Dynajet GmbH, a designer and developer of high pressure tools and systems. Established in 2001, Dynajet manufactures high pressure tools and systems for many industries and applications, from gum removal to cleaning heavy machinery and concrete removal. The pressure range of applications goes from 150 to 3000 bar. “With Dynajet we have acquired a high value designer and manufacturer of professional high pressure water cleaning systems. Herewith, we strategically expand our complete product and power portfolio,” said Gunter Stoehr, CEO of Uraca. Together the firms offer a complete product line of mobile high pressure cleaning systems from 150 bar up to high end ultra high pressure systems. Uraca and Dynajet have been cooperating for a number of years. Dynajet already installs Uraca high pressure plunger pumps in their high pressure cleaning units. Dynajet will remain an independent brand under Uraca ownership and employees will continue to develop and manufacture at the existing headquarters in Nürtingen. “Via Uraca, Dynajet gains an enormous development and innovation potential. Customers will benefit from the expanded offering of products and applications,” said Andreas Fellman, manager of Dynajet. Bad Urach-headquartered Uraca was founded in 1893. Today, the privately held company has annual sales of approximately E70 million with exports accounting for more than 70%. Uraca, which employs around 330 people, designs and constructs high pressure plunger pumps and pump systems for pressures up to 3000 bar and motor ratings up to 2600kW as well as complex high pressure cleaning systems. Applications include the petrochemical and heavy industries.